To celebrate the launch of this new book, we have three (3) copies (autographed by Tina Hutchence) up-for-grabs. An all-new book MICHAEL - My Brother, Lost Boy of INXS by Tina Hutchence will be released on 26th September 2018 and is available for pre-order now. This January we celebrate the birthday of the late great INXS frontman who would have turned 57 today. Michael in Pictures (by Richard Simpkin) - book released. Peaches, daughter of Bob Geldof, has sadly died. Michael's sister Tina shares a few words on the 16th anniversary of Michael's passing. On this date Michael Hutchence's daughter Tiger Lilly celebrates her 17th birthday. Some actors are already being considered for the role as the legendary INXS frontman in the movie based on the book JUST A MAN. Today would be the late great INXS frontman's 53rd birthday so join us in celebrating his life. Michael's sister Tina shares a few words on the 15th anniversary of Michael's passing. This year marks the 25th Anniversary of INXS's legendary KICK album and will released in both Deluxe and Super Deluxe Editions, as well as a limited edition Red Vinyl and 2 digital download versions. On this date Michael Hutchence's daughter Tiger Lilly celebrates her 16th birthday. Finally we announce the winners of this amazing competition! Today would be the late great INXS frontman's 52nd birthday so join us in celebrating his life. INXS have just realeased a BEST OF album as a standard edition as well as a deluxe version for the fans. On this date Michael Hutchence's daughter Tiger Lilly celebrates her 15th birthday. Michael Hutchence would have celebrated his 51st birthday today if he was still alive today. In 1997 Michael Hutchence appeared in an MTV feature with Michael presenting a "Rough Guide To Hong Kong"
On this date Michael Hutchence's daughter Tiger Lilly celebrates her 14th birthday. To commemorate Michael's 50th birthday, Michael's sister Tina Hutchence and myself (Ricky Watcham) want to get Michael's name onto the Hollywood Walk of Fame. 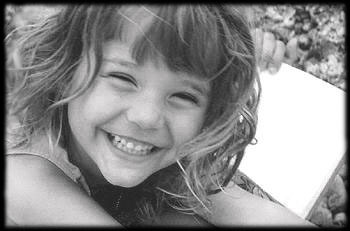 On this date Michael Hutchence's daughter Tiger Lilly celebrates her 13th birthday. This competion is now closed and will be announced this week on the website and contacted by email.. Sadly Michael's stepfather Ross passed away on the 10th May 2009. We also celebrate 5 years of this website since it was re-launched in 2004 as a tribute site for fans and friends. We celebrate and remember the life and times of the INXS frontman and legendary rockstar..
A special message from Tina Hutchence, reflecting on the 11th Year since her brother's death in 1997. This month we have 2x Limited Edition copies of MiIchael Hutchence's Solo Album on auction as well as 2x standard Solo Album CDs. Please note : you must be registered on the Messageboard if you wish to bid. Patricia Glassop, Michael Hutchenc's mother, and co-author of JUST A MAN answers your questions and reads your messages. We now have the entire video of The Loved One online in 10 parts for you to enjoy. Patricia Glassop, Michael Hutchenc's mother, and co-author of JUST A MAN will be answering your questions and reading your messages. Australian actor Heath Ledger, has been found dead in his home after a suspected overdose. Michael Kelland John Hutchence was born on January 22, 1960 at Mater Misericordiae Hospital in North Sydney, New South Wales, Australia. Michael would be celebrating his 48th birthday today. Danny Saber, co-producer on Michael Hutchence's Solo Album, answers your questions. To mark the 10 year memorial of Michael Hutchence we have some limited edition t-shirts now on sale. Tribute concert takes place in Sydney, Australia, to pay tribute to the legendary Michael Hutchence. Star Bar - George Street, Town Hall, Sydney"
To mark the 10 year memorial of Michael Hutchence we have some limited edition t-shirts on sale. Michael Hutchence's mother speaks publicly about Bob Geldof and her granddaughter Tiger Lily. Tina Hutchence talks about the upcoming 10 year anniversary of her brother Michael's death. Michael Hutchence is now on FACEBOOK!! Join the online community and share images, music, your thoughts.....just about anything! Join up and now and make this the biggest online community of one of the greatest rockstars of our time. Listen to American singer Kirsten Price's version of Possibilites, a track off Michael's solo album. Danny Saber, co-producer on Michael Hutchence's Solo Album, will be answering your questions. We finally have website banners which you can add to your site, which (as long as you copy it from our banners page) it will always update on your site when we change it. Exclusive preview of new music from German rocker who recently gave us his cover version of INXS classic "New Sensation"
Rickyrocks (webmaster) meets Kasia Kowalska at Polish Festival in London. Joanne Shaw has produced another amazing black & white oil portrait in her Michael Hutchence series to mark the 10th anniversary of his death. Michael Kelland John Hutchence was born on January 22, 1960 at Mater Misericordiae Hospital in North Sydney, New South Wales, Australia. Michael would be celebrating his 47th birthday today. Share your thoughs with fans, friends and Michael's family. Leave a message in the guestbook. To celebrate the anticipated release of Michael Hutchence's last performance in film, we have 3x copies of the dvd "LIMP"
her a very happy birthday on this special day. We have 5 copies of INXS's Official Autobiography "Story To Story" up for grabs. WIN TICKETS TO INXS ON THE MAX SESSIONS! *** Only available to residents of Australia. "The Loved One" will be featured on The Biography Channel on Saturday 18th February 2006 at 8pm. (re-scheduled). New date will be announced soon. Celebrity Photographer John Stoddart Captures Michael At His Best. Also included in the Gallery are some photos from Award-winning photographer Laura Levine. 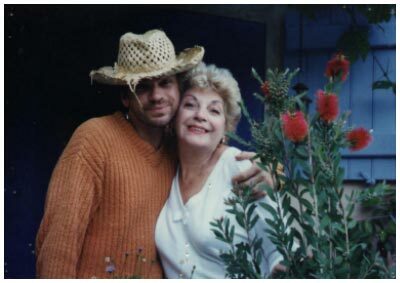 BBC Feature "ON THIS DAY"
KMYI 94.1, we now have Tina Hutchence's interview on "My mornings with Duncan & Mel". her a very happy birthday on this special day..
(The Document they didnt want you to see... that had Michael Hutchence cremated against the family wishes and without their knowledge). section of the JAM Feature. Included in this feature is the JAM DISCUSSION BOARD for related questions and thoughts. As we celebrate the birthday of Michael Hutchence & 1 year since this site's revamp, we have launched our online store with some t-shirts to remember the legendary Michael Hutchence. For the Fans - A special xmas message from Michael's mother Patricia. 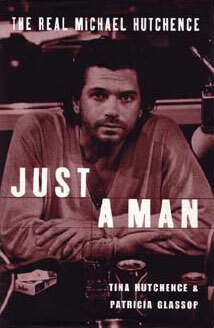 On the 22nd January 2005, the entire version of the book"JUST A MAN" will be available online with a chapter featured every 2 weeks. "On The Effects of Depression"
"The gift he gave is going to last forever "
As promised, here are some images of Michael and his family which some of you may never have seen before. Also I have re-arranged the gallery to include Michael's solo images as well as an INXS section which I will have available in a few weeks. 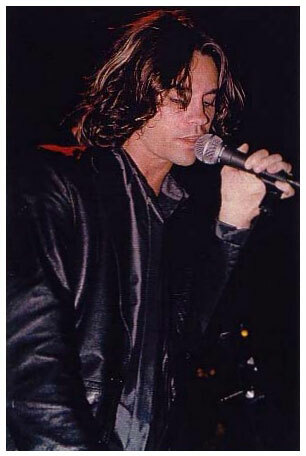 Welcome to the new official Michael Hutchence Tribute website, originally based around the book “Just a man” (by Tina Hutchence and Patricia Glassop), this website now offers a gallery of rare and quality images, multimedia of Michael's solo work, a message board for all your questions & thoughts......plus original never-before-seen hand-written lyrics by Michael. Enjoy!!! Currently being uploaded is one of the most extensive galleries of Michael Hutchence ever featured online. With some never -before-seen images of Michael courtesy of Tina Hutchence & Patricia Glassop, as well as images sent in by fans, this gallery is being updated daily. Tina comments on Gerry Agar's new book "Paula, Michael & Bob"